Google Drive has become a key platform for many companies, and chances are you use it just about every day. With the ability to share, backup and synchronize files across all devices, it’s the perfect collaboration tool. But after you’ve been using it a while and have many shared documents, it’s not long before a ridiculous amount of files have accumulated and finding that “one file” is always a challenge. We know because we’ve been there. Here are some helpful tips to keep your Drive organized so you can find files faster and avoid any unnecessary headaches. When working on a project, share folders—not files. Move items out of “Shared with me” right away. Simplify searches with standardized file names. With numerous files and names to remember, make it easier to find things by standardizing file names whenever possible. For example, at MZ we work with many different clients and assign job numbers to each job by client. We list this number with each appropriate Google file so just typing in the job number brings up the correct folder or file. Also, adding hashtags or special characters to certain file names makes them easier to find when scanning a long list of docs. An example would be putting brackets around [Template] or [Draft]. Use colors or emojis to find folders and files faster. The colors of your folders can easily be changed so you can visually find items faster. To do this, right click on a folder and choose “Change color.” If you’re looking for another way to visually find what you need faster, add an emoji to the front of a folder name and that will automatically move it to the top of your list. To do this, however, you’ll have to install Emoji for Chrome. You can also star important files or folders (just like in Gmail) to find them easier. Create an archive folder for files not actively being used. It’s always good to clean out your Google Drive, deleting duplicate or outdated files. However, there may be some you can’t delete but aren’t actively using anymore. Unfortunately, there still isn’t an archive function on Google Drive, but you can create a folder named “Archive” and place the appropriate files there so they don’t clutter your drive. Search Drive faster with keyboard shortcuts. Google Drive has keyboard shortcuts to help make navigation more efficient and working in Drive easier. Here’s a list of common ones, but you can get the complete list here. 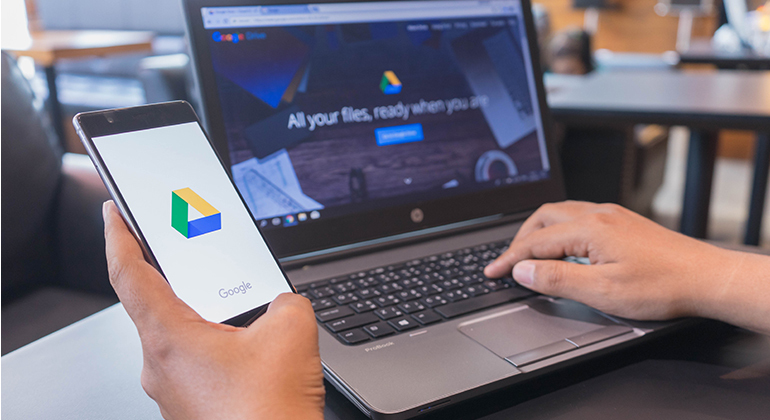 We hope these simple Google Drive tips and tricks help you and your team stay organized and work more efficiently!